Volume 6 of this Journal is a strong statement of our on-going commitment to provide the highest quality information in the form of research, clinical findings, and insights about restorative medicine to those who practice it, and who seek to ground what they do in a solid evidence base. This issue includes original research and several clinically oriented review articles. We begin this issue with a fascinating review by Jeffrey Novack, PhD. He presents various theories for the etiology of progressive neurodegenerative diseases, and highlights compelling reasons to consider a failure to balance autophagy and cell death as the common pathway that unites all of these theories. Given the major public health impact of Alzheimer’s disease and Parkinson’s disease, his examination of the research behind potential drugs and natural products that enhance partial autophagy is critical information for all clinicians. Continuing the theme of highlighting potential neuroprotective therapies, the article by Kevin Spelman, PhD, MCPP, Elizabeth Sutherland, ND, and Aravind Bagade, MD, reviews evidence for the neurological activity of Hericium erinaceus, the Lion’s Mane mushroom. Hericium erinaceus has a long history of use in Traditional Chinese Medicine for various conditions of depletion. Modern scientific studies have shown it to be high in several bioactive compounds that potentially have neuroprotective and neuroregenerative activities. Curcumin is one of the most researched natural substances for its anti-inflammatory and anti-oxidant properties. Despite new extraction and delivery methods, inconsistencies persist in the literature with regard to curcumin’s bioavailability and concomitant bioactivity. The article by Shusuke Toden, PhD and Ajay Goel, PhD examines factors that may influence the bioavailability and efficacy of curcumin, and discusses how to further improve its clinical usefulness. Plants containing berberine have been used in Ayurvedic and Chinese medicine for millennia. The use of berberine for its potentially beneficial cardiovascular and metabolic effects, however, is a relatively new line of investigation. Aravind Bagade, MD, Vinaya Tumbigeremutt, MD, and G. Pallavi, MD present a review of the literature summarizing berberine’s effects and purported mechanisms of action that suggest it may have an important role to play in therapeutic approaches to dyslipidemia, type 2 diabetes, and metabolic syndrome. Carmia Borek, PhD has contributed two research reviews. One outlines evidence for the role that deleterious alterations to the gut microbiome may have in the development of human obesity. It discusses the beneficial impact of prebiotics, probiotics, and synbiotics, and suggests that manipulation of the microbiome may be the next frontier of pharmacological development to treat obesity. Her second article reviews the evidence for the impact of antioxidant supplementation and antioxidant-rich diets on cancer risk and mortality. It also outlines some of the factors that may have contributed to the mixed results of research trials on dietary antioxidants and antioxidant supplementation. An original research article by Darrow Hand, ND and Denis Wilson, MD presents the results of their experimental study to evaluate the composition of three iodine supplements: two powdered products and one aqueous solution that list both iodine and iodide on the labels. Their results are intriguing, and suggest that the form of iodine supplementation may have an influence on its content, at least by the time it is digested and absorbed. Elizabeth Sutherland, ND contributes an original research article that reports on a qualitative study she conducted while part of an NIH-funded research team that developed a patient-centered questionnaire, the Self-Assessment of Change (SAC) instrument. The SAC questionnaire was designed to capture and measure whole-being outcomes often reported by patients receiving CAM (complementary and alternative medicine) therapies but generally overlooked by conventional research. Her study explores the question of whether practitioners from different CAM disciplines define health differently, and therefore look for different patient outcomes. The article by Masa Sasagawa, ND, Jennifer Cornell, ND, Heather Flood, ND, MS, LAc, and Paul S. Amieux, PhD is a critical evaluation of published case reports of naturopathic medicine using the CARE case-report guidelines. The authors conclude that while the CARE guidelines are valid, investigators might want to incorporate additional questions when writing naturopathic case studies to ensure they capture the key tenets of the medicine, such as social and environmental determinants of health and the focus on an individualized treatment approach. I would like to take this opportunity to welcome Liz Sutherland, ND as our new Editor-in-Chief. In addition, I would like to thank our contributors, peer reviewers, and readers, all of whom make the Journal of Restorative Medicine a great success. 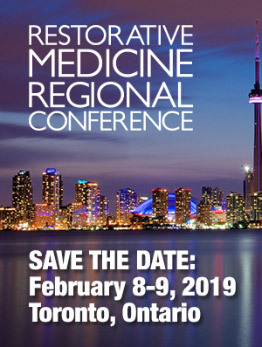 We invite clinicians and scientists to join us in advancing the knowledge-base and application of restorative medicine by contributing your original research, cutting-edge reviews, and thought pieces on this important approach to health and well-being. Many thanks and gratitude to you all. You can also access full issues of the Journal of Restorative Medicine here.